The new 2018 IoT and digital supply chain startup recruits have hit the ground running. They are driving customer opportunity, innovating technology and business–and expanding the SAP solution landscape in powerful ways. Across almost every existing and emerging industry, design automation and 3D printing are helping companies move products from the drawing board to the production line at lightning speed with less risk, lower cost, and higher quality. 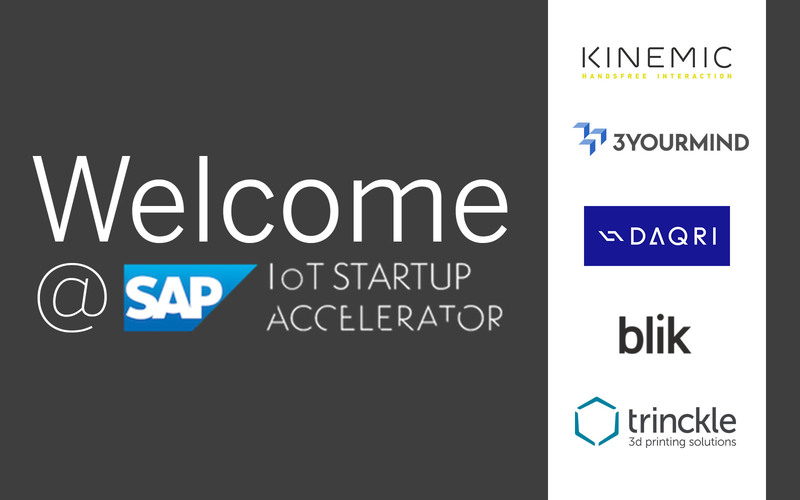 Now, two SAP IoT Startup Accelerator recruits are taking those possibilities even further. 3D printing solution provider Trinckle lets designers transform product ideas into readable files for 3D printers and CAD systems. Users with no coding knowledge can use the Trinckle web-based configurator to create products for every imaginable industry, including consumer products, prosthetics, glasses, running shoes, and tools – even cosmetics cases or one-off personal jewelry designs. The ability to build rapid, customized prototypes and finished products–even at lower volumes–presents an attractive opportunity for SAP customers across a number of industries. 3D printing startup 3YourMind is taking its own revolutionary approach toward design automation. The startup’s two-part business model combines an innovative 3D printing marketplace with a parts identification engine and related additive manufacturing (AM) part identification tool. The tool automatically scans inventories for spare parts that can be produced economically and profitably with 3D printing. The technology behind the AM part identification tool makes it an ideal extension to SAP Distributed Manufacturing–and for SAP customers who are ready to disrupt their own industries or launch new ones. From maintenance and assembly instructions to quality assurance, augmented reality is boosting operational proficiency, decreasing production downtime, instantly identifying problems, and running processes smoothly. Consider DAQRI. The company’s smart glasses and visual operating system are combining digital and 3D content to accelerate innovation, communication, and productivity. From the field to the factory floor, customers can use DAQRI to improve workplace efficiency, safety, and financial performance. The DAQRI approach to virtual reality is a valuable extension to the already growing SAP solution ecosystem. SAP customers continue to respond enthusiastically to virtual reality’s ability to rethink entire tasks and processes. First came the keyboard. The mouse and GUI followed. Then came the touch screen revolution. Now, it is voice and gesture that promise to be the next-generation “natural user interface” between us and the systems we use. Leading the way is Kinemic with a wearable wrist device that enables a given set of gesture controls. It is ideal for inspection field workers who need immediate, real-time information on the assets they are inspecting. With a flick of the wrist, for example, workers can search, find, and retrieve inspection manuals, plans, locations, and other documentation. At the same time, they can also transfer their findings later into an existing SAP or other digital backend system. Big data and artificial intelligence continue to transform business in powerful ways. This year’s accelerator startups are taking that innovation even further, transforming the way goods are received, stored, and shipped inside the warehouse and across the entire supply chain. Logistics solution provider blik is using its new sensor-based technology to transform the way equipment and supplies are accurately tracked in warehouses and on factory shop floors. It is an important, evolutionary step toward full process automation in the digital supply chain. It also bridges a critical, functional gap that GPS coverage and NFC technologies cannot fill – one that must currently be done by hand with bar code scanners. Two major German car and truck manufacturers have already adopted the solution for productive pilot programs. At the same time, SAP supply chain logistics customers see enormous potential in the solution. All told, 2018 is already shaping up to be a great year for innovation. By putting future technology in customers’ hands, SAP is delivering greater business benefits without upfront risk. “That’s an attractive digital transformation road-map for any industry.